Preheat oven to 300 degree and line a large rimmed baking sheet with parchment paper. Make sure the parchment paper goes all the way to the edge. Put all ingredients in a high-powered blender or food processor and blend until a smooth puree is formed, between 2-4 minutes. Pour the batter onto the prepared baking sheet. Use a rubber spatula to cover the sheet uniformly. The batter is sticky, so it may take a few minutes, but it doesn’t have to be perfect. Shoot for 1/8″ thickness. Bake for 10 minutes. Remove from the oven and score the batter with a pizza wheel. 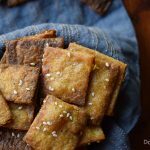 Make whatever size crackers you prefer – these will hold up fine as larger crackers. Sprinkle with sesame seeds and extra salt, if desired. Place back in the oven and bake for an additional 50 minutes or until golden brown. The cooking time will vary based on how thick the crackers are and how green your plantains are. If they aren’t golden brown at 50 minutes, continue to bake and check every 5 minutes until done. Once finished, removed from the oven and let them cool slightly in the pan. Then transfer to a cooling rack by lifting and moving the parchment paper. Once cool, break any crackers that are stuck together into pieces. Store in an airtight container at room temperature for up to a week (if they last that long).